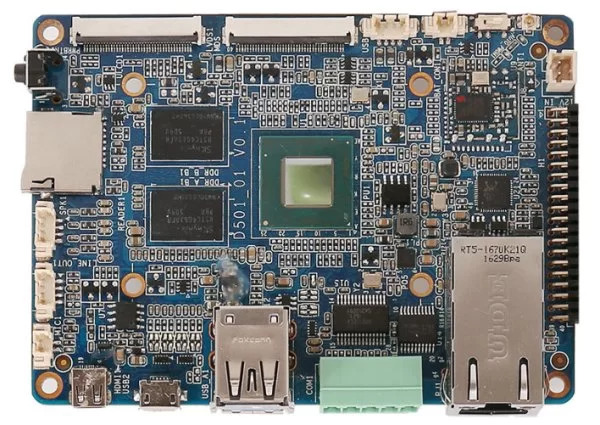 Ohio based company, Estone Technology (AKA Habey) has updated the product page for the new EMB-2610 Pico-ITX SBC. The EMB-2610 follows earlier Habey Pico-ITX SBCs such as last year’s i.MX6 UL powered EMB-2200 and i.MX6 based EMB-2230. This time Estone has used a 14nm Intel Atom SoC. Rather than going with Apollo Lake, they used the quad-core, 1.92GHz Atom x5-Z8350 from the Cherry Trail family that tried but failed to win market share in Android phones. The Atom x5-Z8350 is the same SoC used by Aaeon’s UP Core. Like the UP Core, the 100 x 72mm, Pico-ITX form factor EMB-2610 supports Windows 10 and 10 IoT in addition to Android and various Linux distributions. The new EMB-2610 is available with 2GB or 4GB of DDR3L RAM and comes with a microSD slot and up to or 64GB NAND flash. WiFi/Bluetooth connectivity is available, as well as a GbE port with optional Power-over-Ethernet (PoE), enabled via an add-on board. The EMB-2610 is further enhanced with a micro-HDMI port, as well as LVDS, eDP, or MIPI-DSI, all supported via a touch controller. There’s also an audio header and MIPI-CSI. USB 3.0 and 2.0 host ports are ready along with a micro-USB port, and there’s a smattering of serial, GPIO, and USB headers. This board uses the same 40-pin expansion header found on the i.MX6-based EMB-2230. The connector, which supports optional Estone modules for 8x GPIO, front panel controls, PCIe, and PoE, is available with header specs and diagrams to make it easy to develop custom expansions. Although, the use of the connector PCIe disables the GbE port.